If you have fruit, a couple of nails, and wire, then you can generate electricity to turn on a lightbulb. 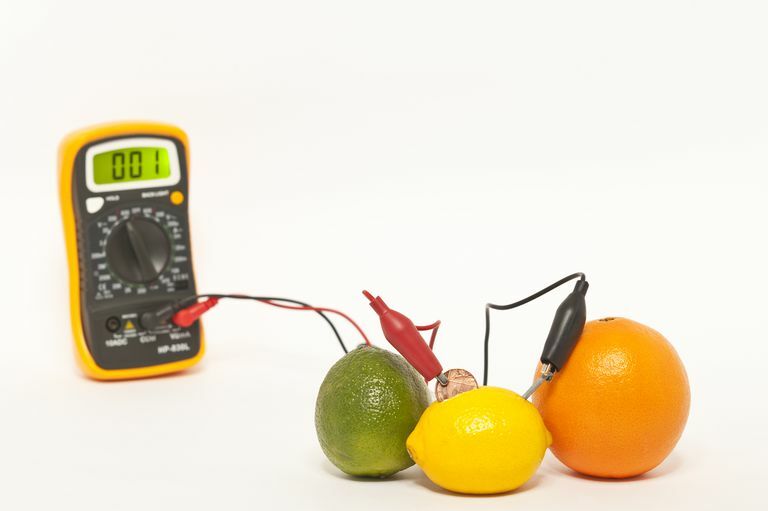 Learn how to make a fruit battery. It's fun, safe, and easy. Set the fruit on a table and gently roll it around to soften it up. You want the juice to be flowing inside the fruit without breaking its skin. Alternatively, you can squeeze the fruit with your hands. Insert the zinc and copper nails into the fruit so that they are about 2" or 5 cm apart. You don't want them to be touching each other. Avoid puncturing through the end of the fruit. Remove enough insulation from the leads of the light (about 1") so that you can wrap one lead around the zinc nail and one lead around the copper nail. If you like, you can use electrical tape or alligator clips to keep the wire from falling off the nails. When you connect the second nail, the light will turn on. Here are the science and chemical reactions regarding a lemon battery. It applies to other fruits or vegetables you can try, too. The copper and zinc metal act as positive and negative battery terminals (cathode and anode). The zinc metal reacts with the acidic lemon juice (mostly from citric acid) to produce zinc ions (Zn2+) and electrons (2 e-). The zinc ions go into solution in the lemon juice while the electrons remain on the metal. The wires of the small lightbulb are electrical conductors. When they are used to connect the copper and zinc, the electrons that have built up on the zinc flow into the wire. The flow of electrons is current or electricity. It's what powers small electronics or lights a lightbulb. Eventually, the electrons make it to the copper. If the electrons didn't go any further, they'd eventually build up so that there wouldn't be a potential difference between the zinc and the copper. If this happened, the flow of electricity would stop. However, that doesn't happen because the copper is in contact with the lemon. The electrons accumulating on the copper terminal react with hydrogen ions (H+) that are floating free in the acidic juice to form hydrogen atoms. The hydrogen atoms bond to each other to form hydrogen gas. Citrus fruits are acidic, which helps their juice to conduct electricity. What other fruits and vegetables might you try that would work as batteries? If you have a multimeter, you can measure the current produced by the battery. Compare the effectiveness of different types of fruit. See what happens as you change the distance between the nails. Do acidic fruits always work better? Measure the pH (acidity) of the fruit juice and compare that with the current through the wires or brightness of the lightbulb. Compare the electricity generated by fruit with that of juices. Liquids you can test include orange juice, lemonade, and pickle brine.